The most exciting part of any restoration project is the successful re-introduction of missing species. However, translocation of flora and fauna is high risk/high return. Natural plant and animal communities of the Auckland mainland are heavily depleted as a result of habitat clearing and plant and animal pests. Many iconic New Zealand birds such as kiwi, pateke, kakariki, rifleman, whitehead, stitchbird, saddleback and kokako are locally extinct. Many other species are still present but in low numbers. A major objective of the Tawharanui Open Sanctuary is to restore these key components of Auckland’s ecosystems either through active translocation programs or by managing habitats to allow for species to re-colonise areas that were previously hostile. 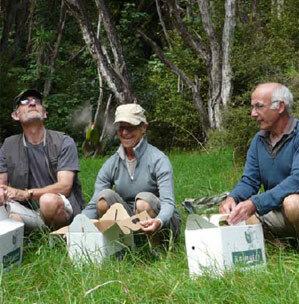 At Tawharanui we are fortunate to have had success with both translocations and self-reintroductions. TOSSI members play a vital role in many aspects of species translocation. We assist in gaining funding for these programs, help catch birds at the source population, assist in releasing birds and manage or assist with on-going monitoring of the released birds. Further translocations of threatened species are being considered but will depend upon an assessment of the habitat available at Tawharanui and whether Auckland Council and TOSSI have the resources to manage these programs. Translocation programs are expensive and time consuming and generous sponsors are critical to their success.